Learn to save thousands a year on your household items. Do you feel like too much of your monthly budget is going to household items like laundry detergent and diapers? I feel ya, mama! It seems like I am always buying household cleaners and toiletries. Well, there are so many clever products and DIY tricks to stop buying household goods. Not only will this post save you thousands a year, but many of these tips are healthier for your family. Women can put up to 515 synthetic chemicals on her body each day without even knowing it – yikes! Here are 20 household items you can stop buying today. One of my bad habits is grabbing a paper towel 500 times a day to clean or wipe up post-meal faces. Some days I feel like I might be the main cause of global warming. 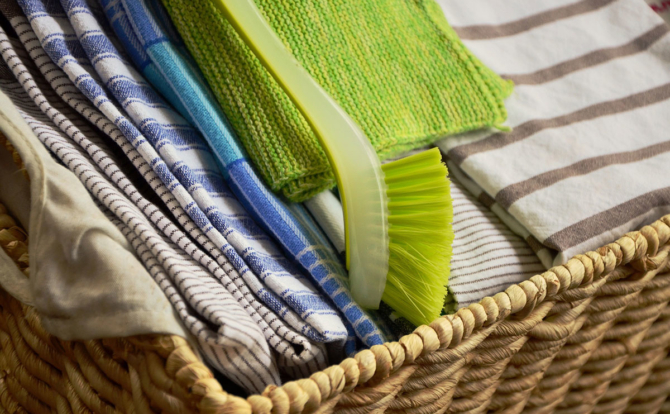 Paper towels are simple to replace with cloths or microfiber towels. Just make sure you use a new towel daily and wash your towels regularly. Not ready to ditch your paper towel roll? Several companies make reusable towels that look like the paper version and even fit on your paper towel holder. This bamboo roll replaces paper towels for six months. Swiffer’s Wet Mop makes it easy to clean up spills or give the kitchen and bathrooms a quick mop without needing to haul out the mop bucket. However, considering that one kitchen can use up to five Swiffer pads, it becomes costly to keep the floor clean. Any of the suggestions above for the paper towel replacements will work for your Swiffer (or similar type of mop). This pin even shows you how to make washable Swiffer pads out of a pair of fuzzy socks. Genius! Using glass food storage containers with lids cuts down on the need to use aluminum foil or plastic wrap, but there is always that one odd leftover that needs to be covered before going into the fridge. But, these reusable silicone lids can stretch over almost any sized dish or even half of a cantaloupe or open yogurt. In some places, stores don’t give out plastic grocery bags for free anymore. You have to pay a small fee per bag! This is standard where I live. I try to keep several reusable bags in my trunk for groceries or library runs. Reusable bags are great to have in the car for when you need to declutter your car quickly. No matter how organized you are, kids have the magical ability to turn any vehicle into a hoarder’s mobile within a day or two. My favorite types of reusable bags are the ones that can stand up, like these collapsible boxes with handles, because it is easy to keep items organized in your car. The grocery bags that hook to the edge of your shopping cart are also super practical. Smart mom tip: organize groceries by pantry, fridge, and freezer when you are checking out to make putting groceries away faster. This tip will also allow you to do another errand or two without worrying about the temperature of your cold food. Take a look at your favorite $3-4 cleaning spray. Do you see what the first ingredient is? It’s probably water. Mamas, we are paying a premium price for products that are mostly water! You can easily make your own cleaners for any area of your home. I use a mix of vinegar, soap, and water for the majority of my cleaning, and the vinegar smell doesn’t linger around for more than a few seconds. And don’t think that vinegar isn’t a suitable cleaning replacement. It’s one strong liquid. Check out this infographic for convincing stats on using vinegar when you have children! With so many reusable water bottle options available now, there is no excuse not to BYOW (bring your own water). I’m a big water drinker – ever since I’ve been pregnant with twins – and can’t get enough of my Thermos stainless steel water bottle. 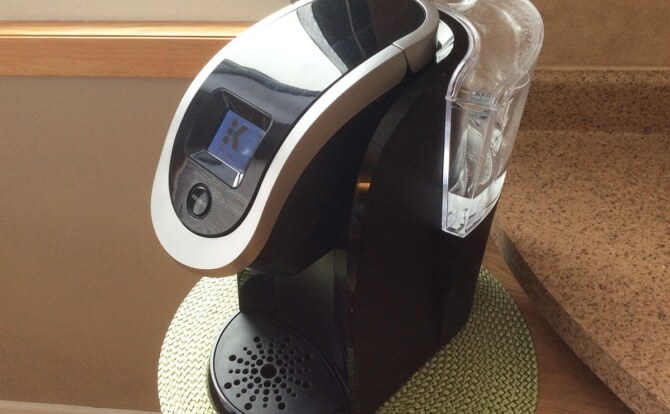 It keeps water cooler longer and is easier to keep clean. I also like the idea of this fruit infuser bottle that has a time marker on it. It is so easy to get distracted with to-do lists that there are days I just haven’t had water until 2pm! Staying hydrated was my go-to weapon for shedding the baby weight. Pack your child’s lunch with kid-friendly reusable sandwich bag designs to avoid plastic waste. If you need more sizes, you can check out these reusable bags that come in different sizes for snacks and sandwiches. You don’t have to use them just for packed lunches. You can also store your cut-up fruits and vegetables in them for a quick and convenient snack when your kids’ leftover chicken nuggets are tempting you. For those who are handy with a sewing machine, there are several tutorials for whipping up quick reusable sandwich and snack bags. Raise your hand if you have two cups of coffee before 9 am? ahem… *raises hand a little bit. Okay, well for me, I usually drink three cups of coffee per day and I know it’s not the healthiest but I can bet that someone in your family is a coffee drinker. That’s why my husband bought me my Keurig coffee maker last Christmas. And that means buying k cups probably every month or two. This can add up. Instead, I use these reusable k cups to cut down the cost for good. My husband, on the other hand, likes his pour over coffee and uses this reusable coffee filter to get the best cup of coffee. My twins LOVE straws. I got them to drink out of straws early on and that’s all I give them nowadays. But, replacing straws can add up – especially since I have twins and they can use up to 6-10 straws a day! Instead, I’m opting for these stainless steel straws. It comes with a straw brush and they’ll also help keep your drink cool! How much do you pay each month for laundry detergent? If your answer is anywhere from $10-20, did you know that you can pay that amount for a whole year’s worth of laundry soap? Crazy! There are several homemade recipes that are non-toxic and affordable. For those who don’t have the DIY bone, Eco Nuts is a natural and popular choice for laundry detergent. You can it instead of detergent and softener or alongside your favorite products. They will even clean a load of cloth diapers! These nuts can also remove pet smells and stains from kids’ nighttime accidents (been there, done that!). Dryer sheets are made to make clothes come out softer and with less static clean. However, sometimes the chemicals and fragrance used on dryer sheets irritate my skin and who loves a laundry room full of runaway dryer sheets. Not me! I like these wool balls because they are larger than tennis balls and can last for 1,000+ loads. Even better, you can add a few drops of your favorite essential oil to the balls to give your clean laundry a boost of scent. Life with kids means a lot of stains and spills. I have tried several stain removing products, and I have not been thrilled with the results. Not only are the store stain removers expensive, but they also have a strong smell. Instead, I have found that mixing together two parts hydrogen peroxide with one part dish soap (I think the Dawn brand works better than other brands in this recipe) is an effective stain remover. Put this mixture on carpet stains, couch spills, and clothing and let it sit for a few minutes. Then scrub the area with a brush. I will then let it sit for a few more minutes before rinsing the area. Did you know that you can save up to $100 a year if you buy reusable menstrual products? It’s true. Many women also have irritation problems – rash or an itch – from wearing disposable feminine pads. And using reusable feminine pads or a menstrual cup is just plain good for the environment. You might be thinking, gross! But, hear me out! It’s not much different than throwing away your disposable ones. Just rinse them off and place them in a mesh laundry bag and then throw them in the wash. When I found out about DIY shaving cream, I never went back! And you know what? You’r husband will get in on this too! Using your own reusable shaving cream will give you a smooth shave every time hands down! All you need is Unrefined Shea Butter, Virgin coconut oil and your favorite essential oils – I like Lemon oil. When my twins were under three years old, I did not feel safe at all putting bug spray with DEET on them. We live up North and it’s mosquito town during the summer here. I ended up putting my twins in long sleeve shirts, hats and pants for most of the summer to shelter them from any bug bites. But, as they got older I wanted to try different alternatives to bug spray, and I found using a DIY version was the best choice for us. Raise your hand if you sometimes sleep with your makeup on? I do, I do! I’ve been guilty of this time and time again. But, after having twins and changing my views on what we put on our bodies, I learned of a great makeup remover that I can make and that lasts. Before you turn up your nose to the idea of cloth diapering, there are many mom bloggers saying that cloth diapers save them $500 or more each year. The exact numbers boil down to what type of cloth diaper you buy, what brand of disposable diaper you would have bought, and how long you plan to use the diapers (i.e. 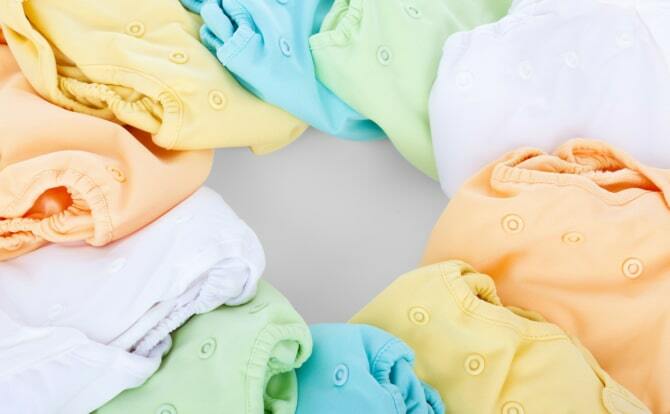 using the same cloth diapers for baby number two makes the savings increase dramatically). One thing I do know is that cloth diapers are so much cuter than the disposable ones. If you plan on cloth diapering, be sure to join a few cloth diapering Facebook groups to learn more and even find great deals on slightly used diaper lots. My twins were just getting out of the baby stage when these reusable food pouches came out, but man, I wish I had these. These are great to store homemade baby food for home use or on the go. These reusable pouches that come with the spoon attachment are perfect take food to go. Keep pouches of food in the freezer to make them last longer. Also, don’t forget that these pouches work great for toddlers and older kids too. They are great for homemade applesauce and smoothies. 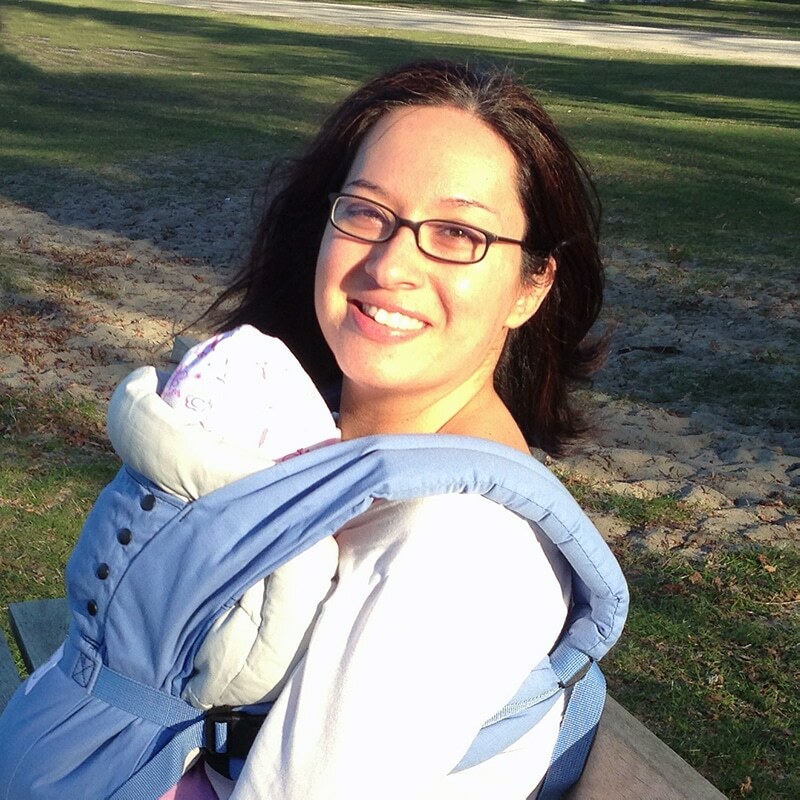 My son had it all – cradle cap, eczema and diaper rash. Being the natural and crunchy mama that I was, I didn’t want to use diaper rash cream on my sensitive son’s bum. Instead, I used my own diaper rash cream. Before kids, I thought baby wipes were just something you needed for babies. Turns out, us, mamas, might need to keep baby wipes on hand until our kids go to college. If you are planning to cloth diaper, it is super easy to do reusable wipes too, since you can wash both at the same time. If you don’t want to cloth diaper, you can still make reusable cloth wipes work for you. 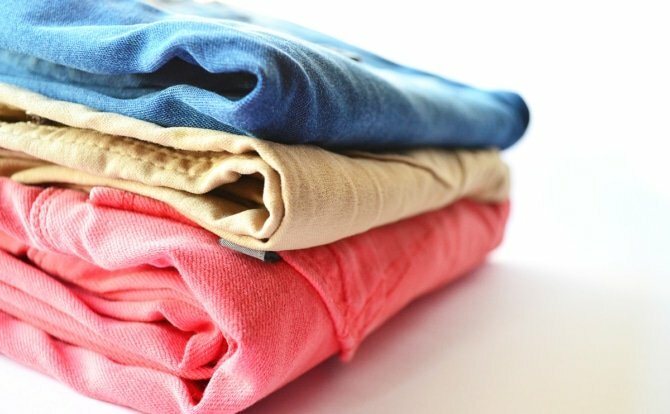 You can buy a set of flannel reusable wipes, a set of baby washcloths or just cut up old pieces of clothes that are too worn for donation (non-fraying fabrics like flannel pajama bottoms work great). Keep them in a container with a mixture of water, a squirt of baby soap, and a drop or two of tea tree oil. You can have an extra container or bag for used wipes to make washing them a breeze. Some families use this system for reusable toilet paper, but that’s a little out of my comfort range. What reusable household items do you use to save money and waste? 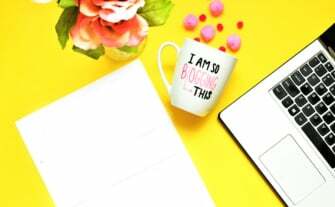 How to Start a Viral Blog + Free Checklist!